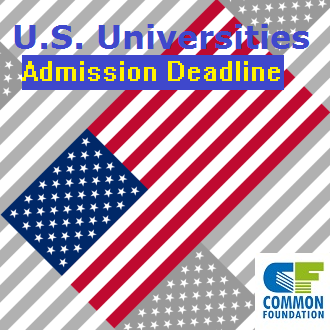 Application Deadlines for US Universities varies by university. Not all universities have same deadline. Top Universities will have deadlines by 8-12 months before the starting date of the classes. Average universities will end admissions by 6-10 months before. In the US, most of the colleges / universities follow either semester or quarter system. The application deadlines are different for each college / university and are different for each system. There are two major education systems in USA. 1) Semester System 2) Quarter System. Each university follows one of these systems. Semester System will have three semesters every year. Fall:- If you want to apply to top universities(A, A+) apply by Nov/Dec of the previous year.A-, B, B+ or C+ Grade Universities deadlines will be around in Feb/March of the same year. Some C- , D Grade universities will have deadlines of june / july for Fall admissions. Spring:- If you want to apply to top universities(A, A+) apply by March/April of the Same year.A-, B, B+ or C+ Grade Universities deadlines will be around in july/August of the same year. Some C- , D Grade universities will have deadlines of Oct / Nov for Spring admissions. Summer:- Usually deadlines are by March of the year. The period from mid August to December is called as the Fall semester. This is the main semester of the year. Most of the students are admitted in the Fall semester. Likewise, most of the scholarships are also offered in the Fall semester. The Fall semester consists of 16 to 18 weeks. Top Universities will close admissions by November or end of December of the previous year. Suppose if you are planning for Fall 2019 semester and heading to Top universities, apply by end of Nov/ December of the year 2018. If you miss these dates lot of universities will accept applications after that dates. You should send your completed application packet to the Admissions Office of the University by the end of March of that year. Some Universities have April or May or even June deadlines. However, we advise you that in any case send your application package by the end of March. This will make sure that you are one of the early applicants and your application for admission as well as scholarship will be considered before others. The period from January to mid May is called as the Spring semester. The Spring semester consists of 16 to 18 weeks. If you plan to apply for the Spring semester, you should send your completed application packet to the Admissions Office of the University by the end of July of the year before. Some Universities have September or October deadlines. Again, if you want to get a head start for admission and scholarship consideration, you should send your application packet by the end of August. The period from mid May to mid August is called as the Summer semester. The Summer quarter consists of 10 to 12 weeks. Normally, Summer semester is divided into sessions, such as Summer session I, Summer session II, etc. Each session is made up of 5 to 6 weeks. Some Universities do NOT take admission for the Summer semester. However, you are advised to check with individual Universities as admission policies are different for each University. The period from late September to December is called as the Fall semester. This is the main semester of the year. Most of the students are admitted in the Fall semester. Likewise, most of the scholarships are also offered in the Fall semester. The Fall semester consists of 12 to 13 weeks. If you plan to apply for the Fall quarter, you should send your completed application packet to the Admissions Office of the University by the end of June of that year. Some Universities have July or August deadlines. However, we advise you that in any case send your application package by the end of June. This will make sure that you are one of the early applicants and your application for admission as well as scholarship will be considered before others. The period from January to late March is called as the Winter quarter. The Winter quarter consists of 12 to 13 weeks. If you plan to apply for the Winter semester, you should send your completed application packet to the Admissions Office of the University by the beginning of October of the year before. Some Universities have November or December deadlines. Again, if you want to get a head start for admission and scholarship consideration, you should send your application packet by the beginning of October. The period from April to late June is called as the Spring quarter. The Spring quarter consists of 12 to 13 weeks. If you plan to apply for the Spring quarter, you should send your completed application packet to the Admissions Office of the University by the beginning of January of that year. Some Universities have February or March deadlines. Again, if you want to get a head start for admission and scholarship consideration, you should send your application packet by the beginning of January. The period from July to late August is called as the Summer quarter. The Summer quarter consists of 8 to 10 weeks. Normally, Summer quarter is divided into sessions, such as Summer session I, Summer session II, etc. Each session is made up of about 5 weeks. Till today, there have been 14891 visitors (24995 hits) on this page!